MultiDyne Fiber Optic Solutions has integrated Dante audio over IP networking from Audinate into its range of openGear solutions for modular, high-density fiber transport and signal conversion. MultiDyne said Audinate’s Dante is the de facto leader in audio over IP networking for the broadcast and commercial AV markets with more than 1100 Dante-enable products available today. 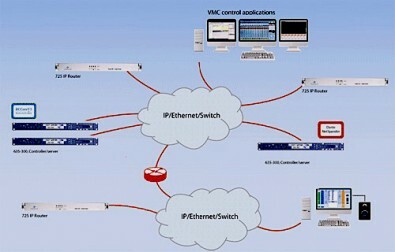 It is used in facilities worldwide for reliable, low-latency, multichannel digital audio transport. MultiDyne offers several ways to leverage Dante across fiber networks, allowing users to convert XLR audio, line-level audio and intercom to and from Dante at the inputs and outputs of MultiDyne hardware. This includes the Bulldog field fiber transport system and the FiberNet optical network control system. The interoperability between Dante networking software and MultiDyne hardware is in part made possible through a special openGear 8x8 module from MultiDyne’s OG Series that the company will unveil at IBC 2017. Though the initial release will support an 8x8 architecture, the scalability and high density associated with Dante and MultiDyne products will allow users to create a “matrix” within MultiDyne hardware to support multichannel capacities up to 64x64. Frank Jachetta, MultiDyne’s president, said while the new openGear module integrates a standard Dante “gateway” to move Dante audio in and out of MultiDyne hardware, what happens once inside is unique, elevating the device to a long-distance transport platform for broadcast and live events. “We have designed this Dante-enabled openGear module to operate within a flexible framework of connections inside our fiber transport solutions that can move between XLR, mic and line switches, phantom power, on and off control, and even two-wire intercom” said Jachetta. “Optical network systems are faced with significant bottlenecks when it comes to moving audio in and out, and must rely on separate fiber-optic transmitters and receivers to put analog audio onto a digital fiber network,” said Jachetta.